The talented man behind Bowie Cocina de Humo, Tirano and Kitchen6 explains his culinary vision and inspirations. 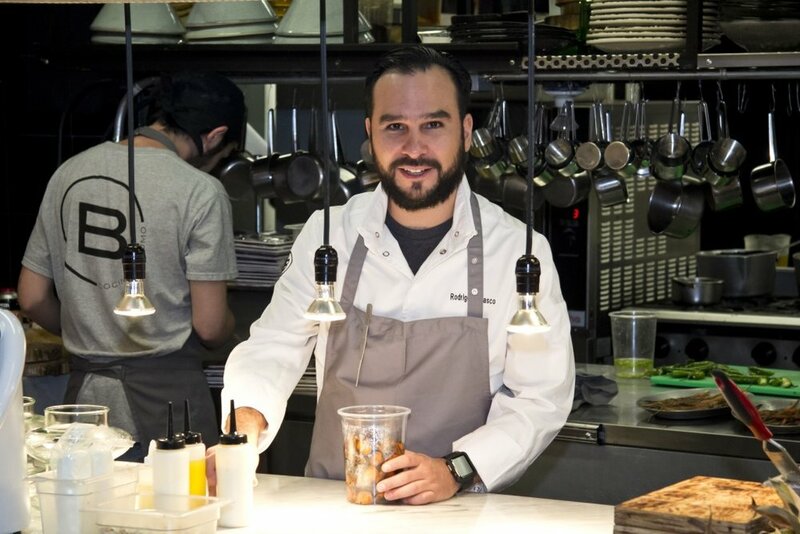 Subtle smoke flavors, attentive service and a fun musical backdrop made Chef Carrasco’s Roma Norte restaurant our favorite dining experience in CDMX. What inspired you to open Bowie? At my family’s country house in Valle de Bravo, we cooked on an open hearth. I saw the power of smoke and got the idea to open a restaurant cooking with smoke and coalfire in the coolest neighborhood in one of the biggest cities in the world. En la casa de campo en Valle de Bravo cocinando en una chimenea. Vi el poder del humo y dije háganos un restaurante de ahumado en leña y carbón. En la ciudad más grande del mundo en el barrio más cool. What’s your connection to David Bowie? While traveling through Texas to learn about the various BBQ methods, I came across a county named Bowie, where the Bowie knife was created, and I’d been listening to the music of David Bowie. I didn’t need anything else to know that Bowie would be the name. Bowie por qué estaba investigado en Texas el proceso del BBQ y llegue a un condado llamado Bowie, había un bowie knife y el playlist era de David Bowie. Dije no hay más bowie será su nombre. Describe the aesthetic and mood of the restaurant. It’s a contemporary Mexican space. Relaxed, but with elegant design touches, and a kitchen that’s visible from virtually anywhere within the restaurant. I love immersing diners in a theatrical experience. Un espacio mexicano contemporáneo. Relajado pero con toques de diseño elegantes. La posibilidad de ver la cocina desde todo el lugar me encanta es involucrar a los comensales en una experiencia teatral también. How did you determine the menu? It’s a compilation of my best recipes after cooking for more than 20 years: European-inspired ingredients and techniques with a Mexican twist. Always with smoke as the foundation. Es una compilación de mis mejores recetas luego de cocinar por más de 20 años. Siempre con el humo como fundamento e ingrediente y técnicas mexicanas y europeas. Music, nature, my Mexican heritage and to let the world know that there’s good cuisine and world-class restaurants in CDMX. That’s what inspires and motivates me. La música, la naturaleza, mi cultura mexicana, hacerle saber al mundo que en CDMX hay buena cocina y restaurantes de buen nivel. Eso me inspira y me motiva. How do you choose the music that plays at Bowie? We have several playlists, I believe. I love music and am always tinkering with it, depending on the day, time and clientele. For example, on Sundays we get families and grandparents who sing along to the classics of the ’60s. The young people also know these songs. But on Thursday nights we have an ultra hip clientele who prefer house, soul or something more progressive that allows them to dine, drink and enjoy the beat. These are the basics with the music, and obviously there’s a lot of David Bowie on all the playlists. Tenemos varios playlist que yo creo. Amo la música y siempre estoy renovando esa parte; la ponemos dependiendo del día, la hora y el target de cliente. Por ejemplo, el domingo es muy familiar y hacemos que los abuelos canten los clásicos de los 60s y los jóvenes lo conocen, pero los jueves en la noche tenemos clientes ultra cool, que se sienten mejor con el house, el soul, y algo progresivo que les permita beber y disfrutar el beat. Es así la mecánica con la música, obviamente hay mucha presencia de David en todas las playlist. I’m the co-owner of two other concepts: Tirano, which is a Mexican steakhouse that’s also in Roma, and Kitchen6, a gastropub on Amsterdam in La Condesa that serves grilled food. In addition, our group is planning on opening a torteria sandwich shop later this year. Si soy co propietario de otros dos conceptos. Tirano, que es un asador mexicano que reubicamos en la Roma también; y Kitchen6 un gastropub que está en Condesa en Amsterdam, que es cocina de grill. En el grupo, planeamos la apertura de una torteria este año de igual forma.